I've thought long and hard about if and, more likely, as a beauty editor, when I'd feel it necessary to get Botox. I've always had zero judgment about those that do—at this point, it's more prevalent to make use of injectables than to abstain. Still, I fancy myself quite natural when it comes to my beauty aesthetic, and wrapping my head around being less so was, at times, complicated. But I'm also of the mindset that if there's a way to feel and look better (and you have the means to do so)—why not? So you can imagine the back and forth conversations I've had with myself about this very topic. Couple those thoughts with the fact that my job allows for gratis and heavily discounted treatments, and you can see my conundrum. I've talked about this issue before: Why do we, as smart, capable, consenting women, feel more comfortable talking about this topic in hushed tones? Answering those questions is, of course, a tall order. There's media pressure, ageism, misogyny—the works. There's also Facetune, Instagram, and HD cameras. But there's another question to contend with as well. 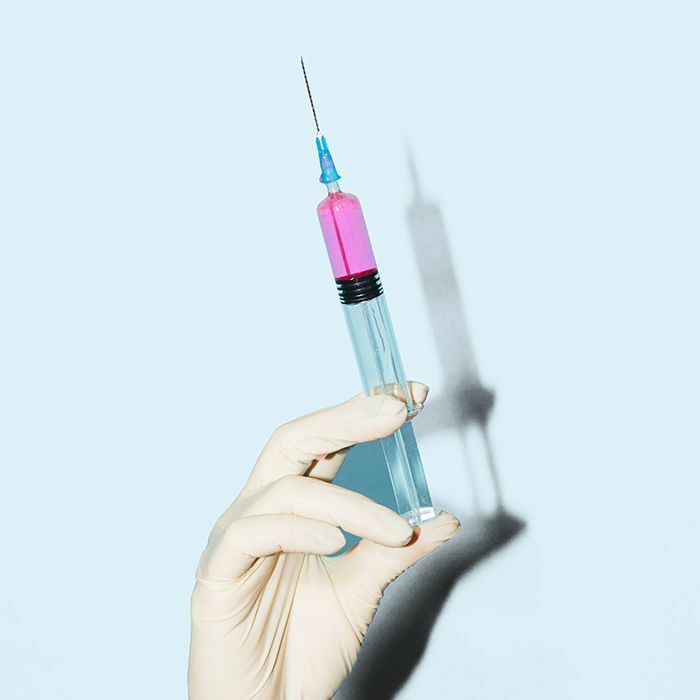 If Botox is going to make you feel good, why not go for it? I say do you. I've gone to consultations, made appointments only to break them, and had, for a while, decided maybe it just wasn't for me (I'm hopelessly squeamish when it comes to needles). That is until I sat down for what was meant to be a 10-minute-long meeting with L.A.-based injection specialist Lisa Goodman. In those few moments, we connected about how I felt, what areas on my face bother me, and how she chooses to treat her patients. "I came up in L.A.," she told me, "working under all those well-known, famous doctors. I thought when I traveled to Paris to assist there, I'd know everything." Not the case, she found out once she arrived. "They have a different way of doing things, They don't 'chase wrinkles' like we do here in the states," Goodman explains. "They think long-term—how will this help in five to 10 years? It's not about a quick fix. That's why everyone in France looks so good and things here can go a bit overboard. It's about your genetics and your bones. It's science." To be frank, she had me at "Paris." When it comes down to it, you have to be comfortable and confident and know exactly why you're making the choice to get Botox. Is it purely about aesthetics? Is there something deeper going on? Make sure to ask yourself these questions and discuss them with your provider. It's all about research and education. Below, I discuss a few things to know before the syringe comes out. "Do your research," advises Goodman. "Check their Instagram and before-and-after photos. Do they do Botox and fillers the way you'd like them done? Are they too subtle or too obvious? These are all things to think about." Truth be told, I'd been contemplating Botox for months before actually taking the plunge. When I look inward, I know if I had really wanted it and actually felt comfortable, I would have done it much earlier. I simply hadn't met the person whose philosophy I felt especially comfortable with. After about 10 minutes with Goodman during an office meeting, I decided to get injected on a whim. Well, not exactly on a whim, as I'd considered the procedure a million times previously, but I felt relaxed in her hands—and I'm glad I waited. "Be an educated consumer," Goodman says. "Decide: What purpose you are doing this for? Are you interested in injections to look good for an event coming up? Is it purely preventative? Are you trying to fix one thing that bothers you? Or multiple things? For example, does your skin bother you, or does your skin and brow asymmetry seem to be what's troubling you?" So many things can be helped with proper skincare and make note of that before deciding to get injected. Have you talked to your provider or a dermatologist about your skin first? Are you happy with the products you've been using? All of these are helpful questions to address before making an appointment. Also, take into account your bones—Goodman did a full few minutes just feeling my face. That way, she knew where I had strong structure and where I might need some help later on in life. For me, it's in my mid-face, a place that seems to have aged faster than other places on my face. Imagine you had to pick one treatment to do that very day—what would it be? It can be overwhelming to walk in and try to change a ton of things about your face. Instead, pick your top priority and start with that. Of course, it's important to discuss everything with your specialist so they can weigh on what they think and may be able to do for you. For example, I walked in lamenting my issues with my forehead lines and dark under-eye circles. Goodman let me in on a secret: You actually need the muscle from your forehead to keep the rest of your face lifted. That, and certain age demographics, are actually more heavily targeted for different treatments. My obsession with my forehead lines stems from that. She told me, "If you just inject your forehead, you may experience drooping and new wrinkles elsewhere." Instead, she mentioned my eyebrows were asymmetrical, which was causing my right eye to look lower (and the lid to look heavier). First, we injected around my brows to even them out and smooth my permanent scowl (it's a real thing). The next time I see her, if I still want to, we can go for the forehead. "It's genetics!" Goodman exclaims. "Everyone is going to age differently, but family plays a lot into that. If you can see how your mother, father, or grandmother aged, it can help determine what some of your priorities should be." For me, my entire family has an issue with under-eye circles. It's in our DNA. So it makes sense one of my biggest priorities was working on those (and it was the first thing Goodman mentioned to me when we spoke). "And make sure to relay that to your provider, it'll help them to make a plan for you," advises Goodman. "This all comes down to you as an individual and your expectations. If you want to look refreshed, maybe that means coming in two to three times a year and getting a Botox routine. If you're really looking to halt your aging cycle, maybe that means coming in five to six times a year with various treatments (such as fillers, Botox, and skin treatments like lasers, micro-needling, peels, etc). This is all based on your ability for downtime, expectations, and overall treatment goals." Next up: Five beauty editors get real about fillers and Botox.